St Neots Rowers celebrate after victories in the first ever Head of the East. Left to right: Mick Staddon, Clive Emmerson, Huw Jarman, Fergus Mitchell-Dwelly, Dom Chapman, Steve Fox, Stuart Williams, Adam Williams and Jim Farrell. 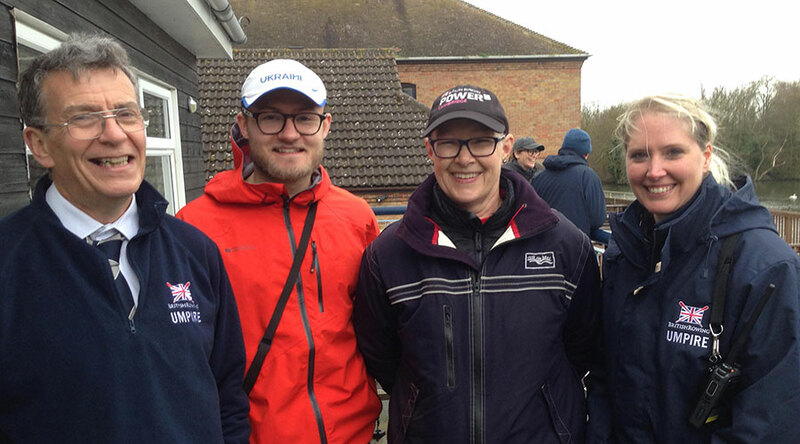 The first ever Head of the East took place at St Neots Rowing Club on Sunday 3 March. This brand new event on the rowing calendar attracted 16 clubs and 124 crews from all corners of East Anglia and London. 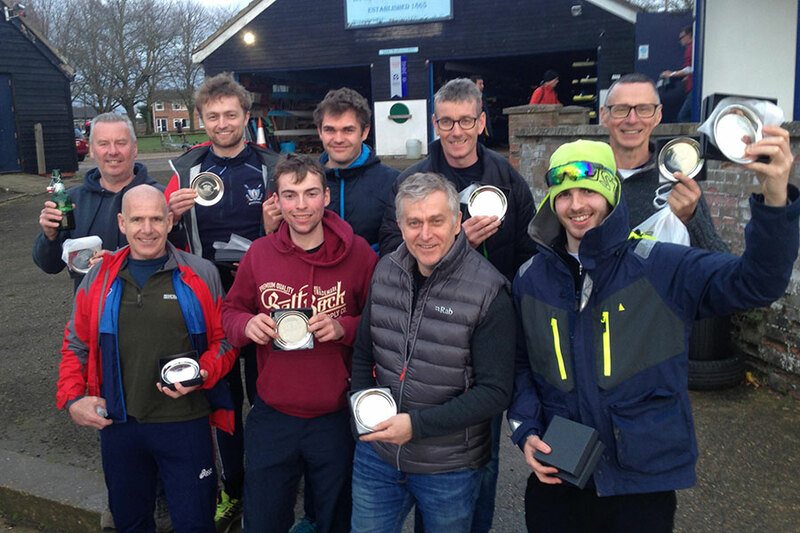 It was organised jointly by the Eastern Regional Rowing Council (ERRC) and St Neots Rowing Club and had categories for all levels, from high-performance to beginner. It is hoped the event can provide a template for future ERRC races around the region. Crews at this event were timed over a 2.2-kilometre course. There were impressive times and close competition throughout the day, despite strong winds making life difficult and forcing the new-to-rowing division to be cancelled. The St Neots men’s eight – Adam Williams, Tom Hetherington Huw Jarman, Max Taylor, Andrew Lawrence, Bryce Taylor, Dom Chapman, Fergus Mitchell-Dwelly and cox Mia Hartwell – set an impressive benchmark early in the day, crossing the line in 7 mins 6 secs to set a course record and win their open category. You can view the video of them passing the clubhouse on YouTube. Most of them won more silverware later in the day: Adam and Tom in the open coxless pairs category, and Dom, Max, Fergus, Huw and cox Ali Young in the open coxed fours category. There was success, too, for some of the club’s more senior rowers: Stuart Williams and Jim Farrell won the masters E/F/G double sculls category, while Graham Mailer, Mick Staddon, Steve Fox and Clive Emmerson, plus cox Adam Williams, won the masters D/F coxed fours category. Both crews were celebrating their third consecutive victory so far in 2019. The most successful clubs overall were Lea Rowing Club, from Hackney, London, and Peterborough City Rowing Club, whose members notched up an impressive six wins each. “Huge congratulations to everyone who won at this historic event for the eastern region,” said Trevor Rickwood, Chairman of St Neots Rowing Club. “We jumped at the chance to host the Head of the East when the ERRC was looking for a venue. It allowed us to run an event different from our own autumn head and summer regatta, and it was great to see some clubs taking part who don’t usually race at St Neots. For Andrew Blit, Chairman of the ERRC, the event marked the culmination of months of hard work: “It’s been an honour to run the inaugural Head of the East at St Neots. I’m incredibly grateful to the club and its members for all their hard work. The event was organised jointly by St Neots Rowing Club and the Eastern Regional Rowing Council. Left to right: Andrew Blit, ERRC chairman; Josh Dexter, who led the organising at St Neots Rowing Club; Helen Middleton, the event’s welfare officer; and Cherry Kemp, chairpersond of the organising committee.